It’s been a rough couple weeks for cuckoo conspiracist Rachel Maddow. Fist the Democrats on the Mueller Report had to finally admit there was NO collusion between Trump and Russia, and now even far left hacks are turning on her. 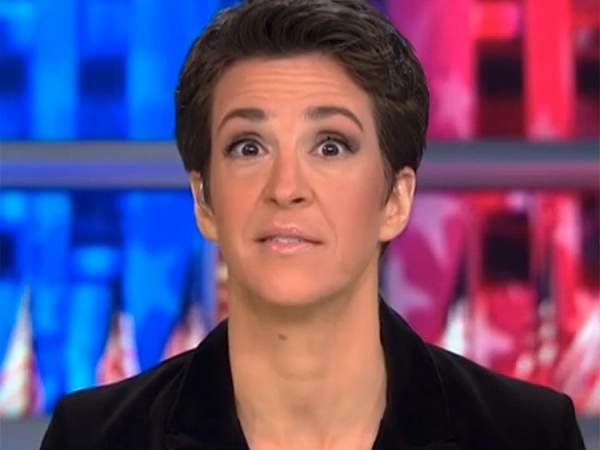 Jacob Bacharach at The New Republic drop-kicked the MSNBC host in a brutally honest assessment of the nutbag conspiracies Maddow has been shoveling out on her show for the last two years. Bacharach went as far to say Maddow was more bonkers than Glenn Beck with a chalkboard. “Bread crumbs” are emblematic of the informal house style at MSNBC. The channel has a range of on-air talent, and its shows each have their own cadence and feel, but they are joined across the arc of each daylong cycle of programming, and especially the larger meta-cycle of the Russia investigation, by a kind of Sherlockian, my-dear-Watson zeal. We are discovering the clues, uncovering the documents, connecting the threads, following the trail in the forest. …The prevailing criticism of Maddow’s on-air personality is that she embodies the stereotype of the smug liberal, and if you encounter her mainly through the brief video clips that are both the reputational currency and the lingua franca of online media, it’s easy to see why. She has a bit of a shtick—a habit of cocking her head or raising her eyebrow and speaking confidently but with an air of almost bemused incredulity. Can you, she seems to be asking, believe these guys? She gestures widely. She shrugs. She is arch and broadly ironic. She is very certain that she is right. Immediacy and intimacy are necessary for a show that consists, for long stretches, of a basically inert shot of a single woman who occupies the left-hand two-thirds of your screen, talking. But these qualities also render less conspicuous the defining trait of the show, which more than any other has contributed to Mueller’s near-messianic hold over segments of the so-called Resistance—a movement that was caught by surprise when Mueller finally submitted his report in late March, apparently concluding, from what we know of the report as of this writing, that Trump and his aides had not conspired with Russia to steal the election. Maddow’s prime-time hour of overheated speculation lacks the antic sensibility and maudlin sentimentality of, for instance, the pre-exile Glenn Beck, who had scribbled all his manic and intricate chalkboard theories of history as conspiracy (and vice versa) with the studied passion of a coffee-shop prophet. But Maddow—and much of her network these days—is frequently just as bonkers.